Academy of Insurance is proud to announce a new line of products, created to empower insurance trainers and learning leaders. Our new facilitator guides take our best-selling online courses and package them with a facilitator guide complete with setup instructions, discussion points, question and answer session and participant guide for each session. 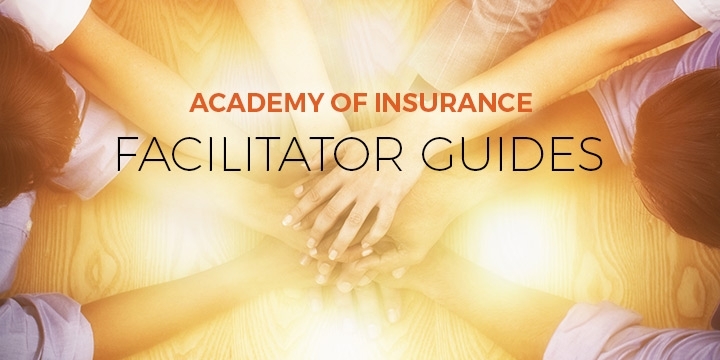 Use our Facilitator Guides as a quick start to your own custom training. Not sure if a course is for you? Let us give you access to the course so you can try it out. Just contact us at support@ijacademy.com. Is there a specific course or topic you'd like to have a facilitator guide for? Let us know. Email us at support@ijacademy.com with your suggestion!